Our “Teaching Tool” Bahá’í ring is out! Shop for it at 95 Gems. For Naw Ruz (new year) in 2012, we are launching our “teaching tool” ring. 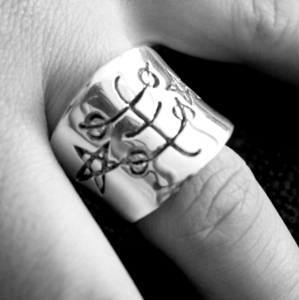 It is a large 20mm wide band with the Baha’i ring symbol engraved. You can purchase it on our website. This entry was posted on Monday, March 5th, 2012 at 11:11 PM	and tagged with anillo Bahai, Baha'i jewelery, Baha'i jewelry, Baha'i ring, Baha'i rings, Bahai jewellery, funky ring, joyas Baha'is, joyeria bahai, spiritual education, teaching the Baha'i Faith, teaching tool and posted in Uncategorized. You can follow any responses to this entry through the RSS 2.0 feed. « Happy Ayyám-i-Há and free shipping for all! Hi! the price for this ring is USD 75.